A safe and efficient border crossing alternative since 1990. The Detroit-Windsor Truck Ferry crosses the Detroit River between Windsor, Ontario and Detroit, Michigan on a scheduled basis in 20 minutes. All customs clearances are completed on-site reducing customs delays. 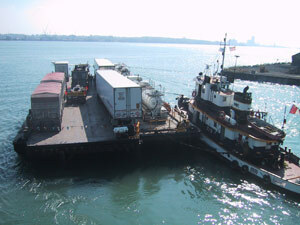 The truck ferry service between Windsor and Detroit saves you time, fuel, maintenance and drive hours. A direct ferry crossing of the Detroit River avoids the congestion delays at other border crossings thereby reducing driver fatigue and frustration. Bottom line - save time and money.